As children, everyone at one point marveled at the beauty and mystery that surrounded [and continues to surround] the dinosaurs. Many of us wished we could touch, see, and walk beside them. And even though dreams are just dreams, there are many theme parks, music festivals and animatronic playgrounds that allow us to relive our childhood fantasies. One of those enablers is the Dinosaur State Park in Rocky Hill, CT. The State Park often goes under the radar, which is unfortunate; it is a natural reservoir that possesses more than 250 species of conifers, magnolias, and other plant life that paint a natural prehistoric picture. Along the Exhibit Center is a +2 mile, green and beautiful long walking trail, and the Park's Museum has multiple interactive exhibits, real dinosaur tracks and several dioramas of Triassic and Jurassic environments, not to mention an extensive collection of fossils. 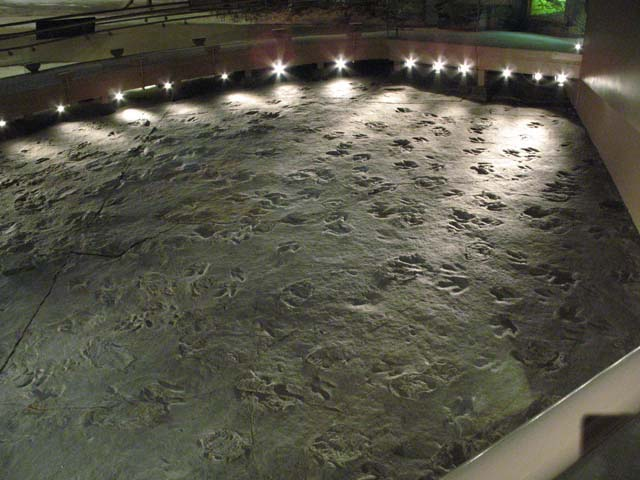 Discovered by accident during an attempted building construction, the +250 real dinosaur tracks help paint a picture of the area's pre-holocenic [before humankind] natural history, and the park itself offers a one of a kind experience for those who still carry around their inner child or who have children of their own. The Park grounds are closed every Monday, but they are open Tuesday through Sunday on a 9am to 4:30 pm schedule, which is perfect for those who plan on spending the day there and going out for dinner after. Additionally, they have a website that provides location, event information and further park history for those who are interested in visiting!